From left: Christie Lee Charles, Cease Wyss and Irwin Oostindie present at SFU’s downtown campus on Oct. 26. People from Vancouver’s arts community discussed how to better work with and support Coast Salish creators during an event at the annual Heart of the City festival. The event titled “Reconciliation and the Arts” on Oct. 26 was geared towards people working in the arts and culture community on Coast Salish territory. After the event was fully registered, its organizers sent out an email to attendees to make it clear that the event was going to focus on actually making change, since the concept of “reconciliation” has become so watered-down. “We have included the word ‘reconciliation’ in the title to entice you,” the email said. 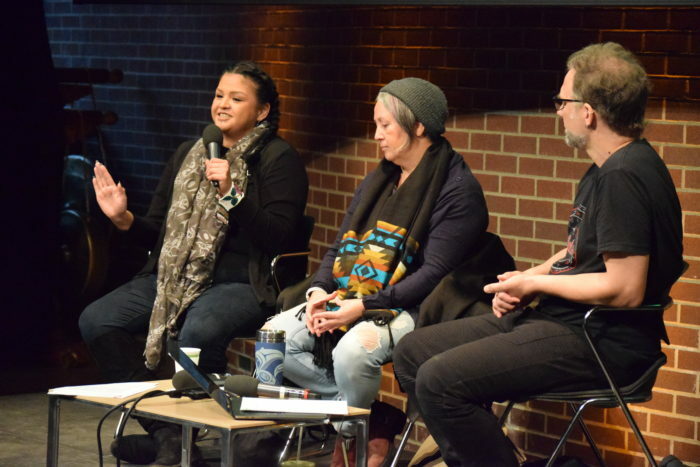 During the event at Simon Fraser University’s downtown campus, Christie Lee Charles of Musqueam, Cease Wyss of Squamish and organizer Irwin Oostindie spoke in a panel about Coast Salish art in Vancouver. The hosts then introduced other speakers from around the arts community before the dozens of attendees broke into smaller groups to discuss what redress could mean within their own workplaces and communities. Charles, a hip-hop artist who was recently named Vancouver’s poet laureate, spoke about how Haida art is everywhere in the city even though the land is Musqueam, Squamish and Tsleil-Waututh. “This is art to people, like a fine art,” she said. Oostindie, a grad student at SFU, said he crunched the numbers and found that Coast Salish artists are chronically underfunded and underrepresented in Vancouver. He said just three per cent of Canada Council for the Arts’ Indigenous arts funding in Metro Vancouver is going to Coast Salish artists. Out of Canada Council for the Arts’ funding for all art in Metro Vancouver, just 0.2 per cent goes to Coast Salish artists. At the Vancouver Art Gallery, he said, 99.9 per cent of featured artists have not been Coast Salish. “Why are we not in an uproar, as an arts community?” Oostindie asked. Maynard Johnny Jr., a Penelakut and Kwakwaka’wakw artist, said working in Vancouver hasn’t always been easy as a Coast Salish artmaker. “I came here more than a year and a half ago with the intention of painting Vancouver Coast Salish and it’s going to be a long road,” he said. Oostindie said it was the fourth year putting on a “Reconciliation and the Arts” event, and it keeps growing and evolving. “It’s always a big crowd and we always say we should do it differently or bigger each year,” he said.